The Mobibooth® Aura is the award winning gold standard of the portable photo booth market. The photo kiosk has ring light built built specifically for the iPad Pro. 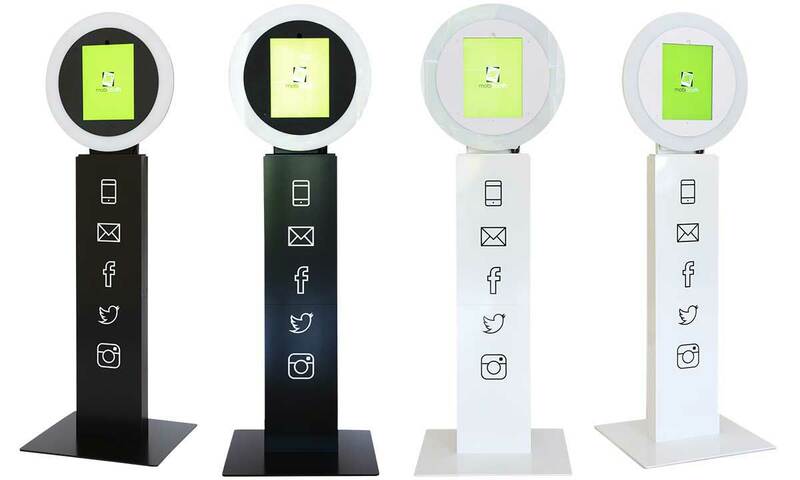 Kiosk comes pre-wired with upgraded fast charge, with all hardware and tools required to assemble. Specify the size of head assembly you'd like base on your iPad. This will tell us how to setup the internal housing and what faceplate size to include. Includes: mirror faceplate, social icon stickers and rolling travel case. Email your logo in PNG format to us at videos@mobibooth.co. Additionally specify the location you'd like your logo in. The default is lower right corner. You can learn more about each of these videos in our store (opens in new window). Our team will send you a print ready set of files with your business logo and information on the selected wrap template. This is not the physical vinyl wrap. A printer stand is the perfect companion for your Mobibooth Aura™. Providing the same gorgeous look and quality build as your Aura photo booth. Add the DNP DS620A dye-sublimation printer and one 4x6 media kit with 800 prints. Protect your printer with a rolling case with tow handle amd custom high density fit foam insert. The case is both TSA approved and shippable. Includes mirror faceplate upgrade, social stickers, travel case and free shipping to the continental US. 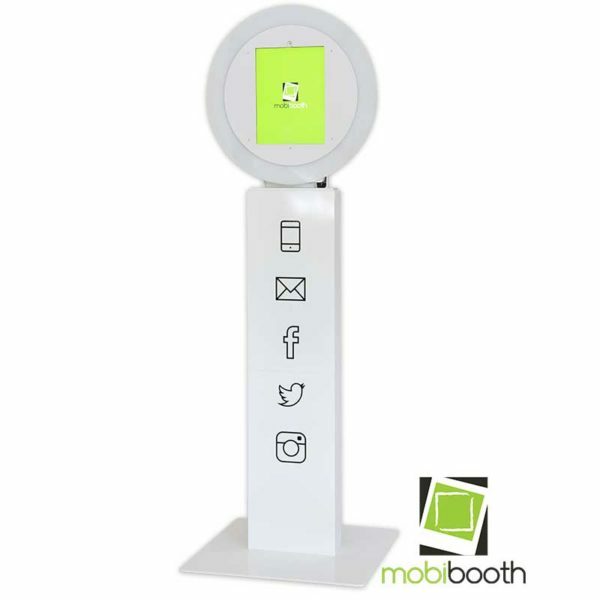 The Mobibooth® Aura is the award winning gold standard of the portable photo booth market. 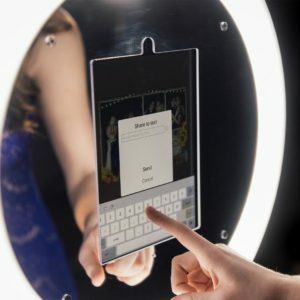 The photo kiosk has ring light built specifically for the 12.9‑inch iPad Pro. The Aura features a smooth tilting head allowing for the perfectly framed photo every time. The Aura has a gorgeous ring light with 240 LEDs and enough light to brighten even the darkest rooms. The premium mirror faceplate give an extra dimension to the unit that naturally draws guests in. 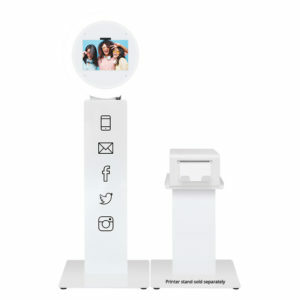 The Aura is fabricated from 1/8” aluminum with a durable powder coat finish (matte black and gloss white) makes the kiosk both sturdy and attractive. The Aura features three piece construction plus baseplate. Setup is quick, under 3 minutes with a little practice. Built for the iPad® Pro 9.7, 10.5, 11 and 12.9-inch (gen 1, 2 & 3) and Surface Pro 4/5/6. Sturdy aluminum assembly with beautiful matte black powder coat finish. Large dimmable 240 LED ring light for gorgeous photos. Dimmer is located on rear for access without taking opening up the unit. Smooth tilt capable of 30 degrees of movement (+10/-20 degrees). 1 lightweight hard case with wheels to easily transport your photo booth. 3 piece assembly plus baseplate. Large surface area for branding. 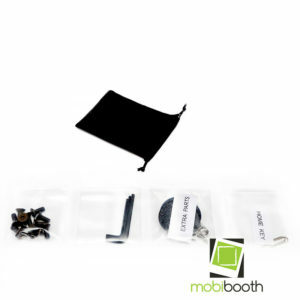 Includes Mobibooth Aura™ Fast Charge installed ($149 value). 1x waterproof hard case with wheels. Assembled: 60″h x 20″ x 20″ and 34 pounds. Head is 20″h x 19″w x 3″d and 9 pounds. 2x – extensions at 20″h x 10″w x 3″d and 8 pounds. Base plate 1/4″h x 20″w x 20″d and 8 pounds. 1x fully assembled and wired top cabinet, black/white. 1x fully assembled and wired bottom cabinet, black/white. 1x 20″ x 20″ baseplate, black/white. 1x 15′ black 16-awg IEC power cord. 1x Apple 29 watt fast charge power adapter & USB-C wiring assembly. 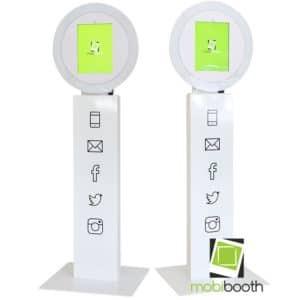 The Mobibooth Aura™ iPad photo kiosk is the platinum standard of the photo booth industry. The Aura was the winner of the Photo Booth Expo Best New Booth in 2017 and Best Booth in 2019. 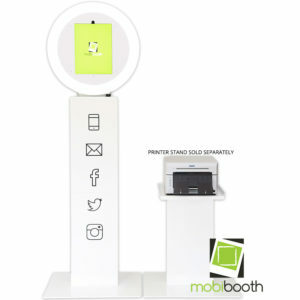 A 2-pack of the award winning Mobibooth Aura™ iPad photo kiosk, the gold standard of the portable photo booth market. Featuring smooth tilting, mirrored faceplate, gorgeous ring light, travel case with foam insert and built for the iPad Pro. Includes 20 templates from photoboothtemplates.com. The Mobibooth Aura SP™ system provides you with the same stunning looks you’ve come to expect of the Aura for iPad but for the Surface Pro. Now you can run your favorite Windows based photo booth software in an Aura.